Saturday Morning, May 4th, The Peach Blossom Stroll participants walked a 1.6 mile track to benefit Relay For Life-Edgefield County. 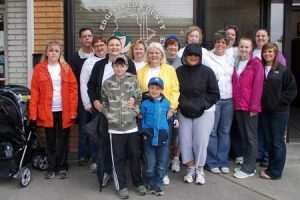 Seventeen participants braved the cold winds and enjoyed a morning stroll thru Johnston – starting at the Edgefield County Chamber of Commerce office, turning around at Beasons Cleaners and returning to the Chamber office. A wonderful way to start off the Johnston Peach Blossom Festival. A donation of $240.00 will be given to Rely For Life- Edgefield County.